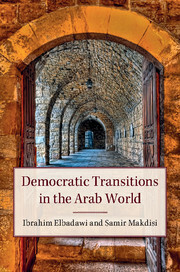 FEMISE is pleased to announce the publication of the book: “Democratic Transitions in the Arab World” edited by Ibrahim Elbadawi (Economic Research Forum) and Samir Makdisi (American University of Beirut) published by Cambridge University. In the wake of the unprecedented uprisings that swept across North Africa and the Middle East in late 2010 and 2011, there was much speculation that these events heralded the beginning of a new age of democratic transition across the region. The result of a four-year research project, this book offers a cross-country analysis of the dynamics of democratic transition and of the state of democracy and authoritarianism from Tunisia, Sudan and Egypt to Syria, Kuwait and Lebanon. Elbadawi and Makdisi identify specific economic, political and social conditions influencing the transition across the region and in each of the individual countries, as well as the requisite conditions for consolidating democracy once the process is initiated. It examines the struggling, halted and painful transitions, where these have for the time being failed, as well as instances in which democratic consolidation can be observed. This is a unique and wide-ranging examination of Arab development and democracy for those examining the fate of authoritarian regimes. The book launching will take place at SOAS, University of London on Feb. 27th 2017. For more information and to order the book online you may click here.